March is National Nutrition Month – How will YOU Celebrate? What can you do this month to make positive nutrition changes? Have you heard the chatter about “cauliflower rice”? If you are on the internet, you may see recipes for this new food idea. I love vegetable stir-fry and decided to try this instead of my usual brown rice. I found a bag of cauliflower rice pearls that was cheaper than a head of cauliflower. It was also very convenient. I sautéed it with garlic and olive oil and used it as the base for my vegetable stir-fry. It was tasty and a way for me to add another vegetable to my day. Toasted slivered almonds made a nice addition. This bag featured recipes for cauliflower pearls fixed these ways: mashed, as rice and steamed. Are you looking for other ways to fix cauliflower? One of my favorite ways is to roast cauliflower. I use olive oil, garlic and smoked paprika – its sweet smoky taste makes it a family favorite. Need a fun recipe for the kiddos? Check out the hiding rabbit recipe with their snow-white bunny tails peeking out from peanut butter celery. Another creative, kid-friendly cauliflower recipe is pizza with a cauliflower crust. Why should you eat more vegetables? Most of us know that vegetables are low in fat and calories, and rich in fiber and vitamins and minerals. If you wonder how many you need each day, visit ChooseMyPlate for specifics. Click here for tips to help you get more veggies in your diet. This great website can also help you plan a healthier lifestyle by exploring the SuperTracker feature. You can log in and create an account to track your nutrition, physical activity and weight. This free tool can be helpful in you in your quest for a healthier lifestyle. What will you do to celebrate National Nutrition Month? Share your ideas in the comments. eatright: Academy of Nutrition and Dietetics (2017). Put Your Best Fork Forward: National Nutrition Month 2017. http://www.eatright.org/resources/national-nutrition-month. In the same way you used to roll your eyes and tune out your mother when she said “eat more vegetables and fruits,” your eyes will probably glaze over at yet another reminder. But of all the health messages we receive on a daily basis, this one really is one of the easiest to assimilate, and it can make a huge difference in whether or not you will develop a chronic disease. Why should you eat more vegetables and fruits? Research shows that eating a diet rich in vegetables and fruits may reduce your risk for cardiovascular disease–and that includes both heart attack and stroke. It may also (1) provide protection against certain types of cancers; (2) help you maintain or lose weight; and (3) enable you to consume more fiber, which keeps you feeling full and aids in elimination. Not sure how much to eat? Just fill half your plate with vegetables and fruits. Sound too simple? That’s because it is! Just remember to select whole fruits (instead of juice) and vary your veggies. To help you get there, one vegetable in particular you might want to reconsider is cauliflower. It is the flower of the plant; growing in tight, compact clusters. This mild white vegetable is available fresh or frozen. 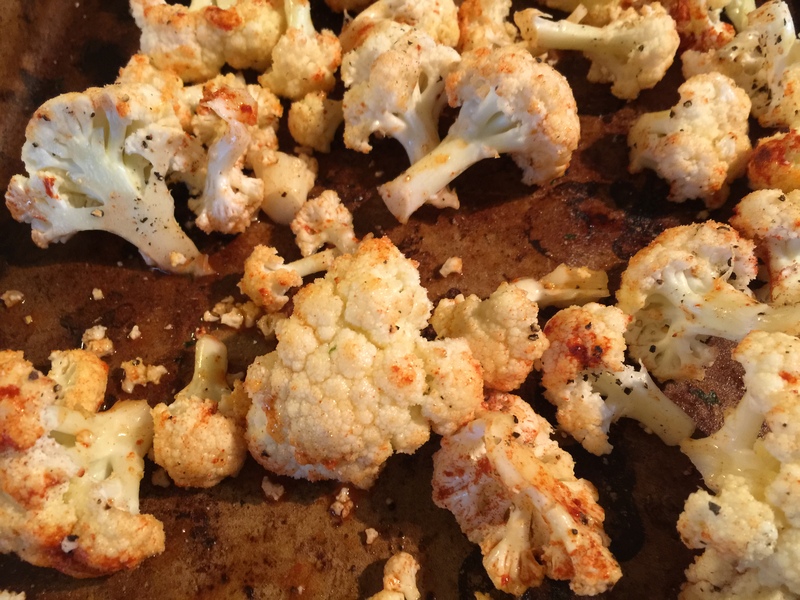 Most of us eat cauliflower raw with dip or steamed as part of a vegetable medley. I personally love it steamed with broccoli, carrots and onions. It is colorful and tasty, and steaming seems to bring out a mellower flavor. Why should you eat cauliflower? Contains photochemicals which have anti-cancer properties. Want a new way to enjoy this vegetable from the cabbage family? Make low-calorie “mashed potatoes” with cauliflower. Roast it for a crunchy unique flavor. I added a dash of smoked paprika for more flavor. Try cauliflower pizza crust – great if you eat gluten free or are watching your calories. Make stir-fry using cauliflower as one of the vegetables. Stir-fry onion, garlic, and cauliflower, then add flavor with low sodium soy sauce. After the vegetables are crispy, add two beaten eggs. Heat until eggs are firm, and then serve with brown rice and quinoa. Enjoy Cauliflower-Cheese Soup on a cool winter day. Try this kid friendly and cute idea, named “Hiding Rabbits”. One head of cauliflower can yield about 10 ½ cup servings. So… I challenge you that next time you are at the grocery, pick up a head of cauliflower and find a new way to enjoy this healthy vegetable.